DOE - From 1945 to 1971, when nuclear dumping at sea was prohibited, Treaty on the Prohibition of the Emplacement of Nuclear Weapons and Other Weapons of Mass Destruction on the Seabed and the Ocean Floor and in the Subsoil Thereof [Seabed Treaty], 1971, an estimated 47,500 barrels of radioactive debris from nuclear labs such as Lawrence Livermore were dumped in the area. Ships irradiated in the Bikini Atoll nuclear bomb tests of the 1940's and '50's were sunk off the islands (including the aircraft carrier Independence), along with numerous undocumented materials. Following the test, the highly contaminated Independence was one of 14 ships brought to the San Francisco Naval Shipyard at Hunters Point for experimental decontamination in exercises that gave birth to the Naval Radiological Defense Laboratory. According to Historical Radiological Assessment, Volume II, Use of General Radioactive Materials, 1939-2003, Hunters Point Shipyard, 'Complete historical records documenting the exact inventories of waste disposed of or the number of containers shipped from HPS was not found. However, several NRDL annual reports do provide some details ... An NRDL letter of 1958 summarized a total of 1,780 tons of DoD waste dumped at sea from 1954 to August 1958 (HRA-1350). 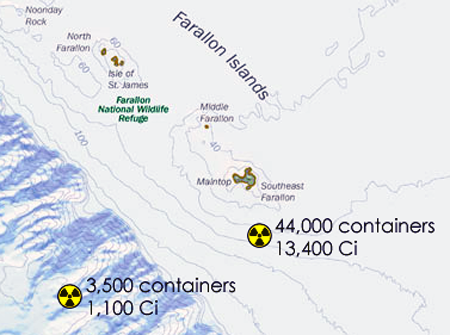 An EPA report of 1980 estimates that 47,500 containers, mainly 55-gallon drums containing 13,500 curies of radioactive waste, primarily short-lived radioisotopes, were disposed of at the Farallon Islands from 1946 to 1970. The report includes waste from both NRDL and commercial shippers (HRA-1243).' According to Lisa Davis, 'Documents obtained by SF Weekly appear to bring the federal government's position on the Farallon waste site into significant doubt. Government reports on the contents of the site do not take into account the aircraft carrier Independence, which was apparently packed with huge amounts of radioactive materials before it was sunk, very probably in the Farallones. 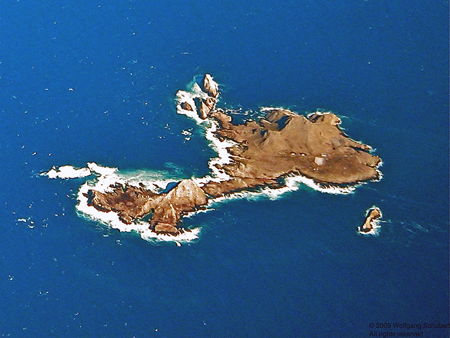 The NRDL's own records strongly suggest that far larger amounts of plutonium, uranium, and other long-lived radioactive substances were dumped in the Farallones than the government has acknowledged. And two government officials say the Navy has acknowledged dumping thousands of barrels of high-level, long-lived, "special" nuclear waste at the site. Fra 1945 til 1971, hvor nuklear dumpning i havet forbydes (Traktat af 11 februar 1971 om forbud mod anbringelse af kernevåben og andre masseødelæggelsesvåben på havbunden og i dens undergrund), er et anslået 47.500 tønder radioaktivt affald fra nukleare laboratorier såsom Lawrence Livermore sænkes i området. Skibe bestrålet ved atombombeprøvsprængninger i Bikiniatollen i 1940'erne og 1950 'erne sænkes ud for øerne (herunder hangarskibet USS Independence), sammen med en række udokumenterede materialer. Efter testen blev det stærkt forurenede Independence et af de 14 skibe bragt til San Francisco flådeværftet i Hunters Point til brug i eksperimentelle dekontamineringsøvelser, som førte til etableringen af den amerikanske marinens radiologiske forsvarslabroatorium. Ifølge Pacific Coastal & Marine Science Center, sænkes beholdere på tre udpegede områder, men de har forurenet et havbundsareal på mindst 1.400 km2, også kendt som Farallon øernes radioaktive affalddepot. Den nøjagtige placering af tønderne og den potentielle fare de udgør for miljøet er ukendt. Se også: Ad Hoc Coastal Counties Supervisors Committee on Nuclear Waste ; The Naval Radiological Defense Laboratory, Hunters Point Shipyard ; Operation Crossroads. The Radioactive Ocean. / Julia Whitty. Mother Jones. Mar. 28, 2011. Fallout: Newly released documents indicate the Navy dumped far more nuclear waste than it's ever acknowledged in a major commercial fishery just 30 miles west of San Francisco. Why won't the government even study the Farallon Islands Nuclear Waste Site? / Lisa Davis. SF Weekly, Wednesday, May 9 2001. - http://www.sfweekly.com/2001-05-09/news/fallout/ Dean, W.E. and Gardner, J.V., 1995, Geochemistry of surface sediments in the Gulf of the Farallones: U.S. Geological Survey Open-file Report 95-527, 57 pp. Karl, H.A., Chavez, P.S., Jr., Ueber, E., Van Peeters, W., Curl, H., Chin, J.L., and Maher, N.M., 1995, Acoustic and remote sensing of barrels of radioactive waste: application of civilian and military technology to environmental management of the oceans (abstract): Pacific Section AAPG meeting. Naval Sea Systems Command (NAVSEA: Historical Radiological Assessment, Hunters Point Annex, Volume I, Naval Nuclear Propulsion Program, 1966-1995. 2000. Naval Sea Systems Command (NAVSEA: Historical Radiological Assessment, Volume II, Use of General Radioactive Materials, 1939-2003, Hunters Point Shipyard, 2004. - 665 s.
Observations of San Francisco Bay from 1900 to 1971 : oral history transcript / and related material, 1970-1972.- 344 s.